As a culture we place a high value on academic education and intellectual knowledge, but sadly we have almost completely forgotten the necessity and treasure of Bible literacy. Some shocking thoughts and statistics to pave the way for what we will go over in this post. While Medieval Christians were separated from the Bible by ecclesiastical authority, many modern Christians are separated by apathy. Herein lies the first and most vital principle about the Bible for Christian living. In order to guide faith and life, the Bible must be read and used. The most potent enemy of Christian life has always been neglect of Scripture. If we don’t read and use our Bibles, Satan wins. So how do we respond to this situation? We talk about it. We are honest with ourselves about the true value we place on scripture in our lives. 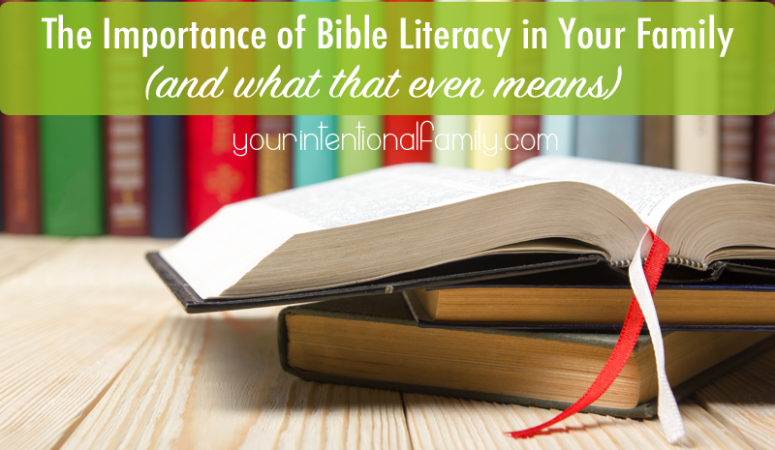 We educate ourselves on what Bible literacy actually is. Then we take actionable steps in our lives and in our homes to make God’s word central. I am not suggesting that you make Bible reading a BIGGER check box on your “Christian Should Do List.” I am simply drawing attention to the fact that we cannot truly function as a follower of Jesus and worship a God that we do not truly know. Bible literacy is essential to the life of a Christian. Literacy is often only considered to be the ability to read and write, but there is actually more to it. Being literate also entails putting these basic skills to work in order to operate effectively in a culture. Reading and writing are tools. But literacy is the ability to interpret and analyze what is heard, read, seen, and felt, and then properly communicate and interact with this input. It is knowing how to read and write well enough to use it in practice. In the same manner, identifying as a Christian and owning a Bible does not make someone Bible literate, any more than having a pencil and paper on a desk makes someone literate. Bible literacy is knowing the content of the Bible, the redemptive story of God, and the future hope He has promised to those who believe in the Gospel of Jesus Christ. Even more than knowing it, is understanding it well enough to live it out and USE it in life. The truth of the matter is that Bible Literacy is not gained through osmosis when someone accepts Christ. Just like most anything that is worth obtaining, it takes intentional effort to make it a priority. It takes seeing and acknowledging the value of the goal, and doing something about it. Bible Literacy comes from intentionally seeking the knowledge and wisdom of God’s word. Reading, studying, praying, and seeking references to guide us in difficult to understand areas. We see a similar downward trend with discipleship in the modern day church, which isn’t surprising considering that Bible literacy is a key component of being a disciple. Knowing God’s word is pivotal in being a disciple of Christ. To neglect God’s word is to ignore the call to make disciples, because it is failing to even be a disciple. All the while, the church is becoming more Bible illiterate and seeing less discipleship take place because the people of the Church don’t see enough value in them to make them a priority. Bible literacy matters for your family because it is a basic foundation of Christian development. Christian development is not a task, but a way of life for everyone in the family. With the overwhelming pace most of us keep, and our long list of commitments and responsibilities, it seems impossible to find time in God’s word even for a few dutiful moments each day. This should not be an excuse from, but a reason for, spending more time in the word. With so much on our shoulders we need guidance, wisdom, strength, and hope to get through each day and to keep our sanity. And many of us live in the just barely sane stage. If you are not being guided and sustained by the word of God, what is preserving you each day? Where you draw your source of strength from will shine through in your life. 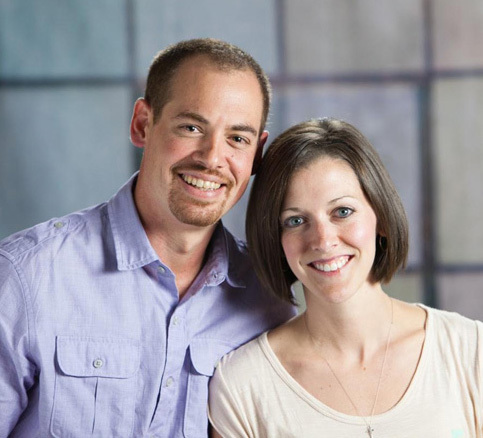 Your spouse sees it, and your kids see it, and they want to see hope in you and hope for them. Our kids are growing up in a world with a strong current of cultural change. Everything is being questioned, from marriage, to gender, to the existence of truth. If we don’t give them a Biblical framework to process this life with, our culture will step right up and do the job for us. Failing to prioritize Bible literacy in our lives, and the lives of our children, is inherently communicating to them that the most important things in their life are academics, education, sports (or other extra curricular activities), and success. It is sending them into battle with armor and weapons that will fail. In closing, let’s look at the parable of the two men who built houses, one on a rock and one on the sand. What are you building your family upon? The solid rock of God’s word, or the sands of morality and culture? 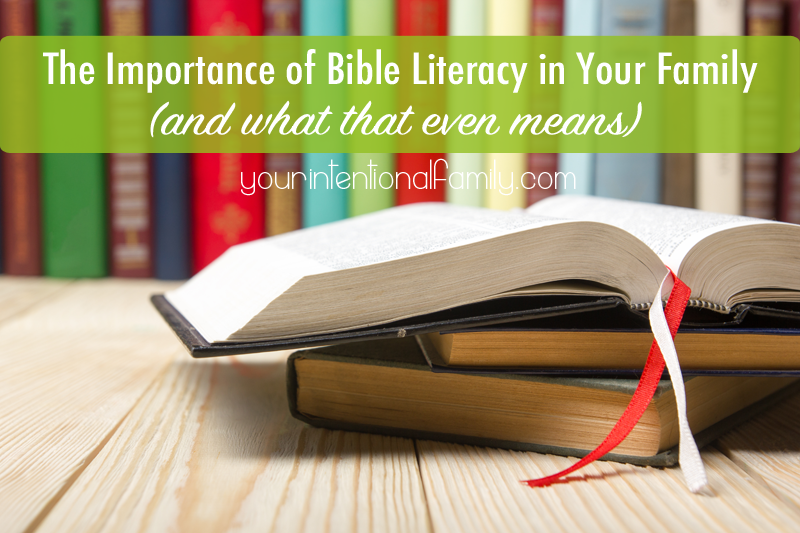 Recognize the immense value of Bible literacy, and make it a priority in your home. Build your house on the Rock. Take Bible Reading off your “Christian Should Do List” this week and just make it a part of your life. Get to know God as a family and talk about His word together. 5 for 5 challenge: I challenge you to pick a time each day for the next 5 days, when your family is all together, and spend at least 5 minutes reading and talking about the Bible together. May God Richly Bless Your Family as you Pursue Him through His Word! I have been following the Bible Studies or readings from January and February. I find them really beneficial and dare I say even exciting. My husband and I are empty nesters, but our grown children come ever other Sunday and we do the studies together at that time. This has enriched our family time and taken us back to the days when the kids were home and the family shared the Gospel together. We are praying for your family in this new endeavor. As a mom, I hope that Leigh Ann is delivered of a healthy baby in June. God Bless and thank you for your work in sharing the Word of God. Catherine, Thank you for the support and encouragement. I love the example of sharing in the Gospel together with your adult children. I hope and pray we experience the same thing! We greatly appreciate your prayers. We are fully trusting in Him to lead us, guide us and provide for us. Rich Blessings to your family as well! 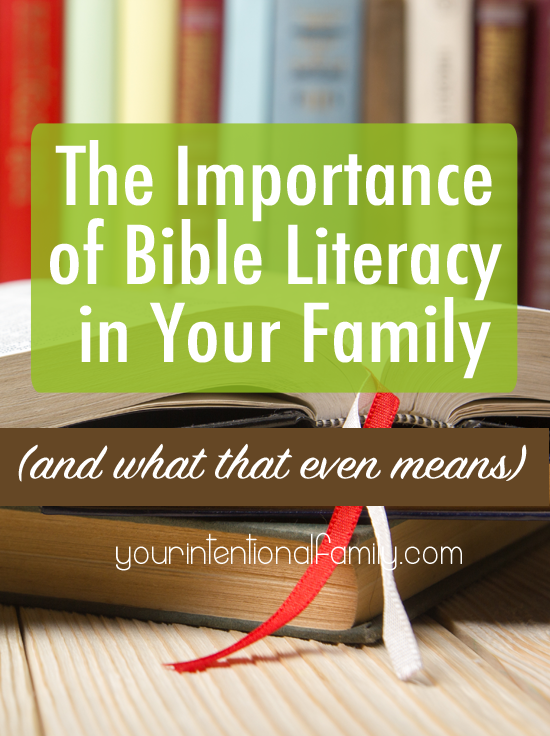 I really enjoyed reading this post, because I completely agree that reading the Bible in the family is so important. My family and I are Christian, but that is something that we struggle with doing. 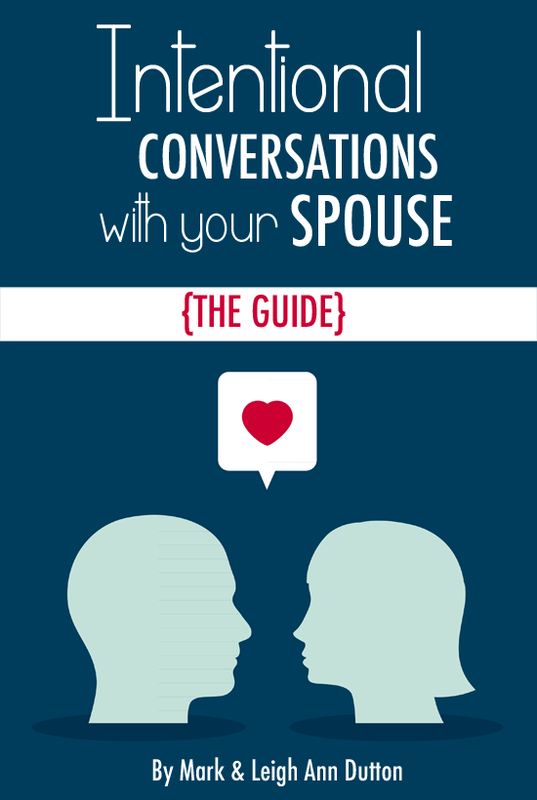 We also struggle with setting aside time to talk about God with our kids. They are very young, somewhat difficult and I’m not even sure that they understand everything. What are some ways that we can come together and know God as a family, even if we have young kids?